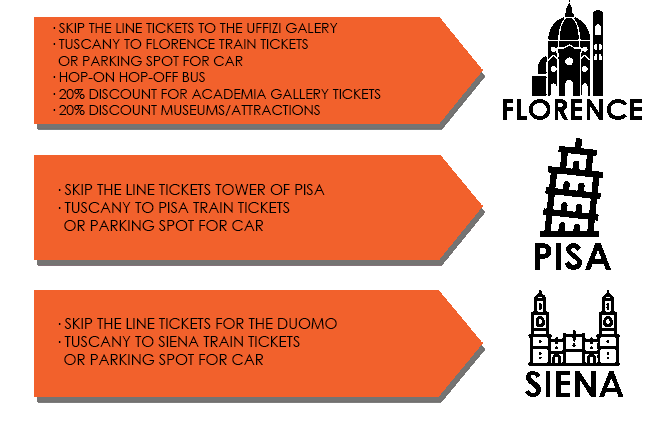 Skip-the-line ticket for Uffizi (Florence), Tower of Pisa (Pisa) or the Duomo (Siena). 2-way transfer by train from your accommodation to Pisa, Florence or Siena or a reserved parking spot in one of these cities. Free ticket for the Hop-on Hop-off Bus in Florence. And 20% discount on all museums, attractions, and excursions in Florence! Tuscany is one of the most visited regions in the world. It is well known for her beautiful countryside but also for her cities that everyone wants to visit for a day: Siena/Florence/Pisa. Florence is famous for Renaissance influences, for her great monuments like Uffizi and Accademia. Siena is a medieval city and the city center is beautiful which you can admire at the Central Piazza (Il Campo). A lot of scenes from the James Bond movie ´Quantum of Solace´ are filmed in Siena. And Pisa is the city of the Tower of Pisa that everyone wants to visit. But of all these cities have more common except their beauty. They are hectic cities with many challenges to be able to enjoy your city trip. There are many waiting lines for museums while you only have limited time. Attractions are not located within walking distance. Traffic is hectic and parking expensive and difficult to find. The ultra-convenient Tuscany City Pass includes skip-the-line entrance to the city’s most famous destinations, 2-way train transfer from different locations in Tuscany to Pisa/Siena/Florence or a parking spot valid for 1 day in one of these cities (except for Siena). And you get discounts to countless further attractions in Florence. Even better, you receive everything by email so that you don’t waste time picking it up when you arrive. When you travel by train you will stop at Firenze S.M. Novella. The Hop on Hop off Bus also stops at Central Station. After your reservation, you will receive instructions how to find the stop. In Florence, you can visit all the major highlights and hop on and off as many times as you like. When you travel by car your parking spot will also be located near Central Station. You get a timeslot for entrance for the Uffizi between 16.00 and 17.00h. The Uffizi works with timeslots to balance the number of visitors that come in every day. The Hop on Hop off Bus also stops at the Uffizi. You will also get a discount code of 20%. So you can purchase the tickets for the Accademia Gallery or to the Dome of Florence to visit it as well. You can see a list of reservations you can make with 20% discount beneath. The Hop on Hop off Bus also stops at Central Station during the entire day and will so if you feel like going back you can take the bus or car to get back to your accommodation. When you travel by train you will stop at Pisa Centrale. From here you can easily walk to the Tower of Pisa. This is a walk of 20 minutes approximately (but you can also take a taxi or the bus). When you go by car you can park your car close to the Tower of Pisa. You will get a timeslot for entering the Tower of Pisa. They work with timeslots to balance the number of visitors that come in every day. After your reservation, you can inform us what time you want to visit the Tower of Pisa. When you travel by train you will stop at Siena Centrale. From here you can easily walk to the Duomo of Siena. This is a walk of 20 minutes approximately (but you can also take a taxi or the bus). In Siena, it is not possible to make your reservation for a parking garage in advance. Therefore we can not provide this service to you. You can buy the Cathedral tickets without the train tickets as well if you want to go by car. You will get a timeslot for entrance for the Duomo of Siena. They work with timeslots to balance the amount of visitors that come in every day. After your reservation you can inform us what time you want to visit the Cathedral. How does it work travelling by train? Tuscany is a big region. To simplify the process we took the destinations on 1,5 hour distance from the cities. If you want to go by train from a separate destination you can inform us about this by sending us an email after the reservation. Don´t miss out important highlights. With the Hop on Hop off flexibility you can hop on and off at the most important highlights in Florence. Start your citytrip relaxed: park your car in the city centre or go by train This is not the case for Siena where you can only go by train or you can purchase the tickets for the Duomo of Siena. For Florence: Hop on Hop off bus tickets, skip the line tickets for the Uffizi, train tickets to Florence (2-way) or parking spot close to Central Station, 20% discount on everything else you want to do in Florence. For Pisa: skip the line tickets for the Tower of Pisa, train tickets to Pisa (2-way) or parking spot. For Siena: train tickets to Siena (2-way) and skip the line tickets for the Cathedral of Siena. The Tuscany City Pass is everything you need for your citytrip to Florence/Pisa/Siena!